The importance of the FINAT Test Methods Since its appearance 30 years ago, the FINAT Technical Handbook has been, and still is, one of the association’s major contributions to the global self-adhesive label industry. The book emphasises the importance of testing in this complex product arena, and currently features 30 test methods in all – including new tests for the evaluation of ‘bleeding’ through paper in labelstock constructions, and scratch-resistance of a UV ink film on different substrates. The latest addition is a test method for UV curing of varnish systems. It goes without saying that without the members of the FINAT Technical Committee, who are the driving force behind this authoritative benchmark, we would not be able to present to you a reliable source of test procedures. All credit goes to them. The 9th edition, published in 2014 contains two new test methods (FTM28 and FTM29). FTM30 was added in 2017. In this edition we have also made a full review of sections 2 and 3 of the Handbook. Some sections have been removed, some have been completely re-written, others have only been slightly modified. By removing some sections and shortening others we have tried to keep the Handbook as compact as possible, still making sure it contains all relevant and important information. English is the global language, but we truly believe there is a need for translations into as many languages as we have the capacity to cover. At the moment the English, German, and French versions are available. All members are encouraged to provide input and feedback about the contents of the Handbook. Together we can make the next edition even more useful! This new test method is intended for UV curing of transparent lacquers and UV white inks. It is not suitable for testing coloured UV inks, since the test method is based on colour-comparison testing. It exploits the reaction of potassium permanganate (KMnO4, 5% solution in water) with remaining unreacted acrylate groups present in the UV lacquer. Unreacted acrylate groups are oxidized by the potassium permanganate solution, and become visible as they undergo a colour change to dark brown. The colour density of the dark spots on the surface correlates well with the crosslinking level of the lacquer, and can be measured using a colorimeter. The darker the spot, the worse the lacquer crosslinking is. Although the 29 FINAT Test Methods described in this publication have been prepared with the utmost care and accuracy, it should be noted that the safety, efficiency and performance of these tests methods and associated procedures are the responsibility of the end-user. FINAT cannot be held liable for any loss, damage or injury resulting from their application. Furthermore, the test methods and associated information do not in themselves imply any specification of performance relating to the materials under test. 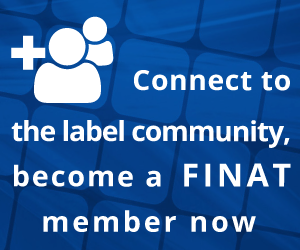 FINAT members and companies that become a member of FINAT automatically receive a complimentary copy in either English, German, French or business Chinese. Of course it is also possible to order additional copies (€ 35 p/copy for members, € 150 p/copy for non-members). FINAT members may also download the Technical Handbooks here. Further information and the order form can be found in the prospectus. FINAT members can also download the individual test methods.